Ah, September! Time to bust out the cozy sweaters and fall pumpkin candles…almost. Where I live, September is notoriously really muggy and still feels a lot like summer and what feels more like summer than a big honkin’ ice cream cone on the back deck. September is my birthday month so you best believe I won’t be doing some boring ice cream. I’me taking the famous two-ingredient no-churn ice cream recipe and turning it into a funfetti-filled birthday cake masterpiece. You ready? I’m going to preface this by saying this is in no way healthy, clean, or good for you in any way shape or form. But it’s dang delicious and you only have a birthday once a year, so go for it! In a large bowl, whip the whipping cream until stiff peaks start to form. Add your sweetened condensed milk and combine it with the whipped cream. Now, this is the fun part. You can quite literally turn your vanilla ice cream base into anything you want. For birthday cake ice cream, you’ll need some cake and sprinkles. For mine, I used some leftover chocolate cake (a great way to use up a cake that’s too dry!) but you can make up a cake with a box of cake mix. I broke up the cake into bite sized pieces and folded it into the ice cream base. I added my sprinkles on afterwards, but they’d be really good folded in, as well! Pour everything into a container with a tight fighting lid. Freeze the mixture for about 6 hours. And guess what! You’ll be able to scoop out the ice cream with an ice cream scoop. It’s the real deal, folks. Now dig in and enjoy. And party like it’s my birthday month! Healthy popsicle recipes that are sure to delight everyone this summer! Perfect for toddlers and teething babies, but still yummy enough for mama! I’ve always loved giving my toddler smoothies. They are such a wicked way to make sure they get all their fruits (& veggies, too!) without them even realizing it! Plus we always have lots of fun creating new flavors and Oliver loves having a say in what we throw into the blender. With the warmer months coming (I swear they are coming!) I see lots of smoothies in our future. But another fun way to have our smoothies is frozen in popsicle molds! YUM! Another fun way to have our smoothies is frozen in popsicle molds! YUM! Jam packed with fruit and real ingredients, these are some of our favorite popsicle recipes that are sure to cool you down in the hot sunshine. My advice is to have these outside, because of the STICKY MESS! Our popsicles are reserved for an afternoon hangout on the front porch or a post-park treat on the deck. I’m also going to be busy making these to have on hand for Elliot who will be able to start baby-led weaning in June when he’s 6 months old! He’s also teething like crazy so it will be a yummy way to soothe those little gums while getting some nutrients and cooling down. Mix everything up in a bowl using a spoon until it’s a pudding consistency. 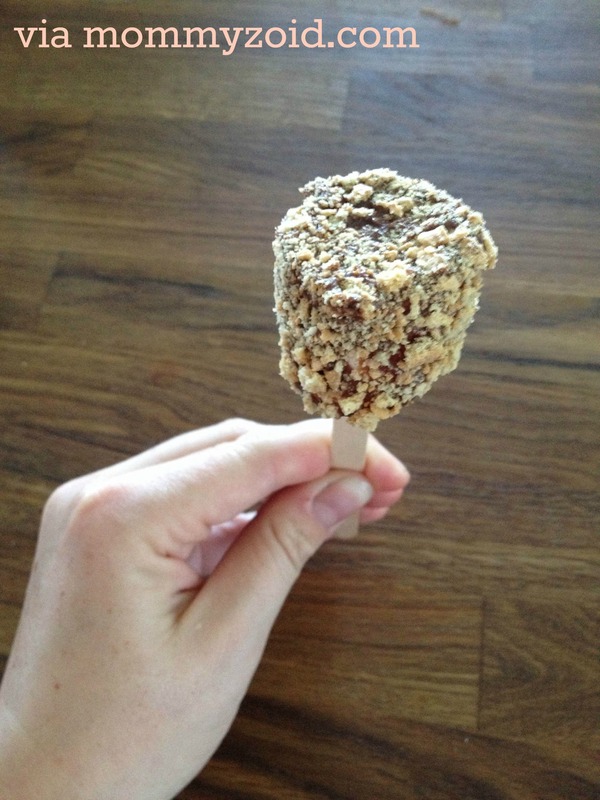 Scoop mixture into a popsicle mold. This recipe makes about one popsicle in the molds I have, which are on the larger size. Freeze in the freezer for 4 – 6 hours. Blend in blender until nice and smooth and then pour into a popsicle mold. This recipe makes about one popsicle in the molds I have, which are on the larger side. Freeze in the freezer for 4 – 6 hours. If you try one of our favorite popsicle recipes, make sure to let us know! Tag me on Instagram so I can see what you made. and if you discover a fun new concoction, let me know! I want to try making as many new recipes this summer as we can! PS: This post contains affiliate links. Please see full disclosure policy here. Elliot has arrived! Just one week ago our boy decided it was time to enter the world. Our entire family is just in love with this little bean and it’s as if he’s always been here in our lives! It feels perfect and we feel complete. What also feels perfect and complete? Our breastfeeding relationship is getting off on the right foot, which is such a surprise for us. I was really expecting it to go south real quick. You can read about the issues I had with my first-born here. Maybe it’s because I prepared for the worst case scenario. I had the number for a local lactation consultant pre-programmed into my phone and had even hired a doula to come check on me in the days following delivery to make sure my latch was looking OK and assess his latch. I also had alerted every health care professional that our child will likely have a tongue and/or lip-tie like our first-born did. I have been making everyone we encounter, including our baby chiropractor, check his little mouth and give us their opinion on the state of his mouth/our latch. Throw all that in the blender until it’s the consistency you like, adding more milk or ice until it’s the way you like it. I tend to make mine thick like ice cream and it legit tastes like a treat. When I’m craving something sweet, this is also a great alternative to a sugar-laden snack. Let me know if you try this recipe or if you have something similar to this that helps keep your supply where it needs to be. PS: This post contains affiliate links. See my full disclosure policy here. It’s no surprise that I love a good recipe using pumpkins. I love to bake with them and am guilty of at least one Starbucks PSL a season. You’ve been sharing so many amazing pumpkin recipes with the Ladies Collective Linkup, I figured it’s about time I share as many as possible all in one place. Check this amazing round-up of pumpkin recipes from @mommyzoid! Which recipe are you dying to try? Do you have a favourite pumpkin recipe? Let me know in the comments! PS: I’ll be sharing on this post on these blogs! Happy Fall Y’all! Nothing says fall like pumpkin flavoured anything. I say that as I’m sitting in my kitchen with a cup of Pumpkin Chai Tea from David’s Tea, eating my masterpiece pumpkin spice muffins. I’m sure you’re sick of Pumpkin-everything by now but I swear these are worth it. Mix everything together! Pour into greased muffin tins and back at 375 for 10-15 minutes. Use a toothpick to check if they are done! Stick it in to the centre and if it comes out clean, they are ready! Let them cool and ENJOY! You should get 6 fairly large muffins for on batch. I added ground Flax and Psyllium Husk but forgot to add more liquid so they turned out a tad too dry but still edible. You can definatly substitute anything for anything just keep the ratio between wet and dry ingredients fairly similar to the recipe. Welcome to the first ever instalment of Food & Fitness Friday! Eating well and keeping an active lifestyle are key to mental health. No matter what any journal or study will ever say, the benefits of exercise and eating healthy do wonders to your mood. Well, that’s been the case for me, anyway! Since I started to eat clean and eliminate unneeded gluten from my diet, I’ve noticed such a difference. Add in exercise and you’ve got a recipe for a better mood. 2 cups of Large Flake Oats. Mix it all up and put it in either a muffin tin or in a loaf tin. It wont rise so be sure to fill cups or tin accordingly. Bake for 15-20 minutes at 350 degrees. Take out and let cool before diving right in there and enjoying that deliciousness! Comment below or tweet me and let me now what you thought of the recipe! Easy, huh? Instagram me a picture if you want to! I’d love to see it!